‘SMHPLQF’, commonly sold under the trade name of LITTLE QUICK FIRE, typically grows to only 3-5’ tall and to 2-4’ wide. 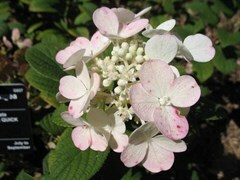 It is a miniature version of Hydrangea paniculata ‘Bulk’ QUICK FIRE (PP16,812). It is particularly noted for its early summer bloom of flowers (about one month prior to the bloom of most H. paniculata cultivars) in upright panicles. Bloom is on new wood and continues throughout summer into fall. Each panicle (to 6” tall) contains abundant showy sterile florets which emerge white but change to pink and finally reddish-purple as the summer progresses. U.S. Plant Patent PP#25,136 issued December 2, 2014.